In "Tomorrowland," Walt Disney's vision of the future gets a 21st-century overhaul from the minds of Brad Bird and George Clooney. 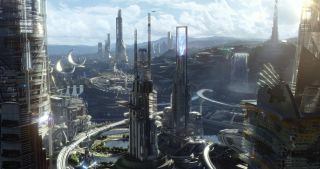 HOLLYWOOD, Calif. — The world of tomorrow is a pretty wonderful place … at least that's the sentiment of the makers of Disney's new epic, "Tomorrowland." At a press conference a day after the press's first look at "Tomorrowland," cast and crew were on hand to answer questions about the movie's core message. Brad Bird, the director of the film (and previously of "Iron Giant," "Ratatouille" and "The Incredibles"), said he gets his optimism from a space-race perspective. "I remember the moon landings," he said. "I was in the air when they were going to step out onto the moon's surface. We were flying in from Denver, and I thought I was going to miss it!" Bird laughed at the memory. "When we landed, I ran to the nearest TV monitor. There must have been 400 people packed and watching and cheering as Neil Armstrong set foot on the moon. That feeling has never left me." In fact, NASA's role in "Tomorrowland" has come full circle. The movie begins with the young protagonist, Casey Newton (played by Britt Robertson), doing her part to stop the planned demolition of Pad 39 at the Kennedy Space Center. NASA allowed the production to shoot at the launch complex, despite the story elements of Casey's thwarted sabotage. Brad Bird, director of Disney's new epic "Tomorrowland," explains that the feeling he had when watching Neil Armstrong walk on the moon has never left him. "The chance to shoot at NASA was fantastic," Bird said. "To be out at that launch pad where so many noble journeys started." Not long before the shoot, Bird had been in Los Angeles when the space shuttle Endeavor made its final ferry flight to Los Angeles International Airport. "Everybody came out and watched it, and there was this weird feeling of pride mixed with great sadness, of 'We're not doing that anymore, are we?'" But the cast and crew were in for more than just a trip down memory lane when they arrived at the Kennedy Space Center. Bird continued, "We were able to watch the MAVEN [Mars orbiter] launch from the pad, which was one of the coolest moments in the [making of the] film." Britt Robertson echoed the sentiment. "For me, NASA represents a specific hope that ties into the movie in a symbolic way. NASA represents … the human race being able to explore the universe. I think that's in line with the movie in terms of theme. If NASA wants to go and see what is out there, maybe that will help our future to be something to be excited about." Actor George Clooney, as inventor Frank Walker in Disney's new movie "Tomorrowland," is seen near the perimeter fence outside NASA's Pad 39A at the Kennedy Space Center in Florida. Bert Ulrich, a NASA spokesman, said he was pleased with the collaboration. "We knew what the tone of the film was — it's a film about inspiration, and we were happy to be a part of it … we're excited that there are productions out there that want to include NASA and highlight what we are doing, especially when they are inspirational and get kids excited about space exploration." And, perhaps more than any recent Disney film, this movie had the direct stamp of Walt Disney on it. "One of the last things that Walt Disney filmed was [himself] talking about this Experimental Prototype Community of Tomorrow," said Bird, referring to the full name of Disney's EPCOT attraction in Florida. "He called it 'our Florida project.' When he talked about it, he said, 'yes, there will be an amusement park, kind of like Disneyland, but the main attraction is this!' and he pointed to [plans for EPCOT] and said that it was going to be an actual place where you can try out new ideas…"
EPCOT is a 300-acre attraction dedicated to the future; it opened next to Walt Disney World in 1982. As Disney himself put it, EPCOT "will be a community of tomorrow that will never be completed, but will always be instructing and testing and demonstrating new material and new systems." While the intention of making EPCOT a true, working community of the future was never fulfilled, the futuristic vision of the park lives on in the form of projects like "Tomorrowland." "His face just lit up when he talked about it," said Bird. "You needed someone like Walt as a catalyst to get it done … even in his last moments, he was dreaming about the future and making these crazy ideas happen and become real, and accelerate the pace of all that. It's all very moving to me." Clooney picked up on the idea of a Disney-inspired future as well, Bird said. "George was pitching jetpacks. He wants everyone to have one!" Clooney responded with a chuckle. "Now that they serve alcohol in the park, I think that could be a great deal of fun," he joked. "Tomorrowland" opens in theaters nationwide today (May 22).